← Can Mobile Rule the Ad World? It is not surprising to see the breakdown of demographics who value smartphones over other traditional types of media. Here BI Intelligence has given us an overview which shows that the younger generation are more likely to miss smartphones then TV and vice versa for adults. Kicking off Business Insider’s Ignition event on Tuesday, Business Insider CEO Henry Blodget detailed where digital business is headed. And of all the interesting visuals from that presentation, this chart, based on Ofcom data charted by BI Intelligence, stood out. 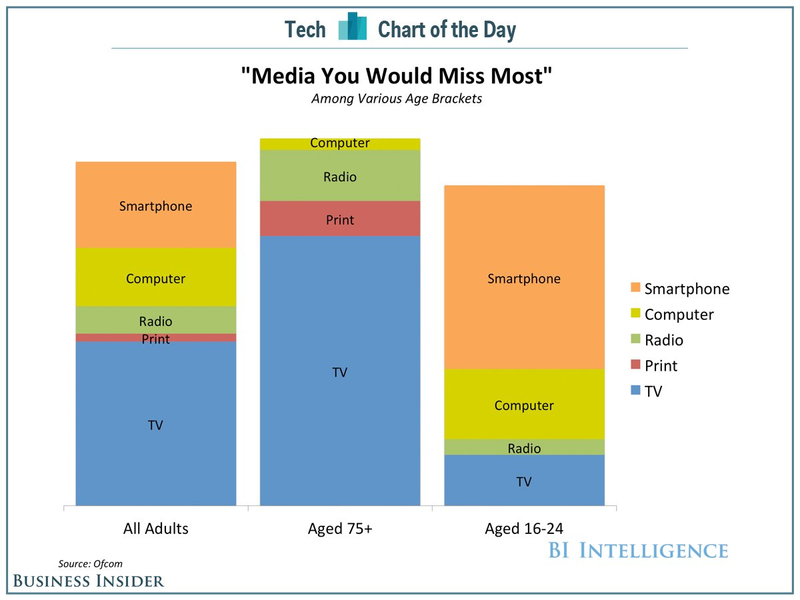 It shows a major shift in the types of media most important to various generations. People between the ages of 16 and 24, for example, would not blink an eye if newspapers and magazines went extinct; smartphones are the “must-have” device of the younger generation. The breakdown among all adults shows a much stronger craving for TV over smartphones and computers, and the older generations (those over 75) don’t care much about computers and have absolutely no problem living without smartphones. This entry was posted in Mobile Advertising, Mobile Marketing, Multi-Screen, Smartphones. Bookmark the permalink.